Instructions for installing DataStax Enterprise using the DataStax Installer when you have root permissions. You can install or upgrade on any Linux-based platform using this installer. If you don't have root permissions, use Using the DataStax Installer to install (root permissions not required). To install earlier versions, see Installing DataStax Enterprise 5.0.x patch releases. 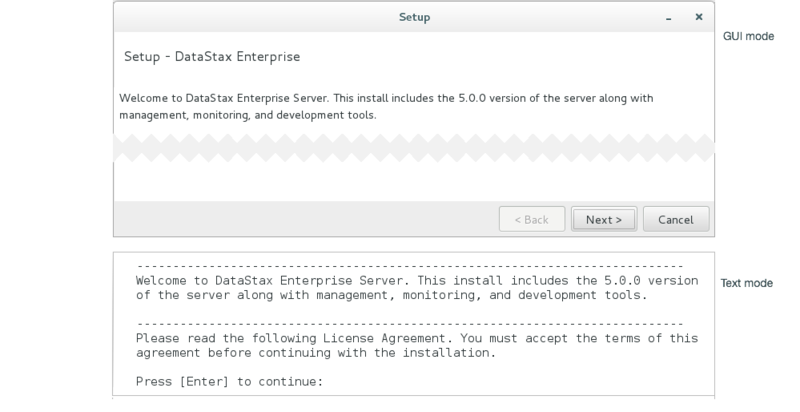 The DataStax installer installs DataStax Enterprise. It does not install OpsCenter or DevCenter. If you select Developer Related Tools during installation, DataStax Studio is installed. To specify pre-configured cassandra.yaml and dse.yaml files, use the unattended install with either command line or property file options. Help displays a list of the available options and their default settings. $ sudo ./DataStaxEnterprise-5.0.15-linux-x64-installer.run --prefix /usr/share/dse --enable_vnodes 0 ## Command line option. $ sudo ./DataStaxEnterprise-5.0.15-linux-x64-installer.run --optionfile ../datastax/DC4-analytics.prop ## Property file option. For configuration parameter information, see the installer options described in Using the DataStax Installer to install using command line or properties file commands. No Services: This installation sets up DataStax Enterprise as a standalone process. It does not require root or sudo access. See Using the DataStax Installer to install (root permissions not required). Services and Utilities: This installation sets up DataStax Enterprise as a service. It installs DataStax Enterprise in system locations. Default Interface Network interface for the DataStax Enterprise server. Single node clusters: use 127.0.0.0. Cluster Name Name of the cluster. You must use the same cluster name for each node in the cluster. Seeds All nodes use the seed node list for finding each other and learning the topology of the ring. Single node clusters: Set to empty. Multiple node clusters: List of seed nodes. Do not make all nodes seed nodes. Important: Before upgrading an existing cluster, see the Upgrade guide. The important files to review for upgrade are dse.yaml, cassandra.yaml, and for service installs /etc/default/dse. If dse.in.sh or cassandra.in.sh have been modified, make modifications to the cassandra-env.sh or the dse-env.sh instead. Changing these files is not recommended. DSE Analytics Spark or Spark + Integrated Hadoop (DSE Hadoop). DSE Search DSE Search (Solr) simplifies using search applications for data that is stored in a Cassandra database. DSE Graph DSE Graph is a graph database for managing, analyzing, and searching highly-connected data. DSE Advanced Replication DSE Advanced Replication supports one-way, distributed-data replication from remote clusters that might experience periods of network or internet downtime. The available options depend on the type of installation, permissions, and your previous selections. Update Operating System Update some system packages and dependencies. Does not upgrade or install major components such as Java. Start services Select Yes to start all services when the installation is complete, or select No when additional configuration is needed after installation. Type of analytics Spark only and Spark + Integrated Hadoop (DSE Hadoop). OpsCenter Address Launches OpsCenter in your default browser. Run PFC Enable or disable the Preflight check. The Preflight tool is a collection of tests that can detect and fix a node's configuration. The tool can detect and fix many invalid or suboptimal configuration settings. It is not available in tarball or No Services installations. Table 5. Preflight Check OptionsThese options appear when Run PFC is selected. Attempt to Fix Issues Enable DataStax Enterprise to attempt to fix invalid or suboptimal configuration settings. SSD Drives Enter the paths to the Solid State Drives. Separate the drives by a comma. Drives Enter the paths to the hard drives. Separate the drives by a comma. Time to run Disk Benchmarks Set to simulate a normal load. Threads per Disk Benchmark Set to simulate a normal load. OS User ID for Service Default: cassandra. Because the DataStax Agent relies on user cassandra, DataStax does not recommend changing the default. If changed, you must manually install, update, and configure the DataStax Agent. OS User Group for Service Default: cassandra. See above. Enable Virtual node (vnodes) Enable or disable Virtual nodes. Analytical nodes (DSE Hadoop, BYOH): not recommended. Logs Directory Log data for Cassandra, Spark, Hadoop, Pig, Hive, and Tomcat. See the default file locations for Installer-Services and package installations or Installer-No Services and tarball installations. In System Configuration, review any warnings about potential issues. After the installation completes, review the installation logs to verify the installation. Note: If you have closed the logs, see Services or No-Services installer locations. Note: For other start options, see Starting DataStax Enterprise as a service.